Urinary problems in ageing men are often caused by prostate disorders. The most common of these disorders is benign prostatic hyperplasia (BPH)., BPH ultimately leads to constriction of the urethral lumen and gives rise to lower urinary tract symptoms (LUTS).,, An ideal assessment tool to detect severity of LUTS must be noninvasive, quick, inexpensive, and reproducible with high diagnostic accuracy. Ultrasonography has all these criteria, and in addition, it has the advantage of nonuse of contrast material and ionizing radiation. International Prostate Symptom Score (IPSS) is a validated questionnaire developed in collaboration with The American Urological Association to assess the severity and treatment effect in men with BPH., IPSS can be divided into storage (IPSS-s) and voiding (IPSS-v) symptoms., Storage symptoms appear to be due to secondary bladder dysfunctions (bladder wall hypertrophy and collagen deposition in the bladder), whereas voiding symptoms result from direct urinary flow obstruction. IPP has been shown to be capable of causing either more voiding symptoms due to ball-valve phenomenon or elongation of the prostatic urethra or more storage symptoms due to increased bladder neck irritation. Considering the burden of BPH in our environment, there is a need for a noninvasive and available investigative modality for objective and yet reliable assessment of BOO. IPP is not yet used in the routine assessment of patients with BPH, and most studies done on the correlation between IPP and IPSS are in non-Africans. This study was carried out to determine the correlation between IPP and IPSS among new adult Nigerian male patients who presented with symptomatic BPH. This prospective cross-sectional study was conducted over a period of 15 months (July 1, 2014–September 30, 2015) among new patients with BPH who presented at Nnamdi Azikiwe University Teaching Hospital, Nnewi. Ethical approval was obtained from the institutional ethical review board, and written informed consents were obtained from the patients. The population comprised all new patients >40 years seen in the urology clinic with symptomatic BPH. Those patients with LUTS due to nonprostatic disorders, carcinoma of the prostate, previous pelvic or urethral surgeries, bladder calculi, neurologic deficit and those on anticholinergic medications were excluded. Patient evaluation included a detailed history with IPSS. Physical examination was carried out (including a digital rectal examination and neurological examination to exclude neurological deficit(s) and neurologically related bladder dysfunction). Urinalysis, urine microscopy, culture and sensitivity, and serum prostate-specific antigen were done. IPP was assessed using transabdominal ultrasonography using Prosound model SSD 3500 (Aloka Co. Ltd., Tokyo, Japan) with an abdominal probe frequency of 3.5 MHz. IPP was measured from images of the prostate obtained using the midline sagittal image by drawing a line from the anterior to posterior intersections of the bladder base and the tip (highest point) of the intravesical prostatic protrusion [Figure 1]. This was measured in millimeters and divided into three grades (grade I: 0–4.9mm, grade II: 5.0–9.9 mm, and grade III: 10.0 mm and above) as done by other researchers., The bladder was allowed to fill passively with at least 100 mL of urine by asking the patient, after voiding, to ingest 1 L of water and performing the abdominal ultrasonography, after confirming that the bladder contains between 100 and 400 mL of urine by abdominal ultrasound, about 2 h later. The total prostate volume (TPV) was calculated using the prolate ellipsoid formula (length × width × height × Π/6), which was already keyed into the abdominal ultrasound machine. The abdominal ultrasound assessment was done by the same consultant radiologist in the presence of one of the researchers. Data collected were analyzed with SPSS version 20 (IBM; SPSS, Chicago, IL, USA). The data were subjected to analysis of variance (to compare mean parameters among different grades of IPP), and Pearson's correlation was used to assess correlation where necessary. P < 0.05 was considered significant. A total of 101 men who met the inclusion criteria and signed the consent form were recruited into the study. The mean age was 67.09 ± 10.93 years, and the age range of the subjects was 42–90 years. The mean total IPSS was 17.05 ± 7.62/35. The mean storage symptom IPSS subscore (IPSS-S) was 7.81 ± 5.17/15. The mean voiding symptom IPSS (IPSS-V) subscore was 9.24 ± 3.16/20. The mean Quality of Life (QoL) index was 4.75 ± 1.59/6. Using total IPSS, eight participants (7.9%) had mild grade symptoms (total IPSS 0–7), 61 (60.4%) had moderate grade symptoms (total IPSS 8–19), and 32 (31.7%) had severe grade symptoms (total IPSS 20–35). Eight (7.9%) participants had IPP of 0–4.9 mm (grade I), 33 (32.7%) had IPP of 5–9.9 mm (grade II), and 60 (59.4%) had IPP of 10.0 mm and above (grade III). The comparison of mean parameters of participants with different IPP grades is shown in [Table 1]. Using post hoc test, the differences in mean parameters were in participants with grade III IPP (IPP 10.0 mm or more). There were significant positive correlations between IPP and total IPSS (Pearson's correlation coefficient = 0.406, P = 0.000). Scatter plot of IPP and IPSS indicates a linear relationship between the degree of IPP and severity of LUTS [shown in [Figure 2]. There was also a statistically significant positive correlation between IPP and storage IPSS subscore (Pearson's correlation coefficient = 0.398, P = 0.000). Moreover, there was also a significant positive correlation between IPP and voiding IPSS subscore (Pearson's correlation coefficient = 0.356, P = 0.000). Furthermore, there was a significant positive correlation between IPP and IPSS QoL index (Pearson's correlation coefficient = 0.457, P = 0.000). Higher IPSS QoL score corresponds to deteriorating quality of life in relation to LUTS. Hence, there was a significant positive correlation between IPP and poor quality of life attributable to symptoms of urinary problems. IPP can be a useful marker for the management of LUTS/BPH,, and a higher IPP grade is associated with a higher risk of clinical progression in LUTS. There have been conflicting reports in the literature of the correlation between IPP and IPSS. In studies using transabdominal ultrasound probes (Lee et al. and Lu et al.) and a study by Tjahjodjati et al. using transrectal ultrasound probe, significant positive correlation was found between IPP and total IPSS score. On the other hand, using transabdominal ultrasound probes (Sigdel et al. and Lee et al.) and transrectal ultrasound probes (Hou et al. and Lee et al. ), no significant correlations have been found between IPP and total IPSS score. Sigdel et al. and Lee et al. measured IPP with transabdominal ultrasound at bladder volumes of 150–250 and 150–200 mL, respectively, with an unspecified ultrasound probe frequency, unlike this study (bladder volume of 100–400 mL and abdominal ultrasound probe frequency of 3.5 MHz). This may account for the differences in findings between their studies and this study. Transabdominal ultrasonography was used in this study because it is less invasive and more readily available (even at patients' bedsides and in remote hospitals) compared with transrectal ultrasonography. Furthermore, Lee et al. have suggested that transabdominal ultrasonography is better for the measurement of IPP. The mean age of 67.09 years of the participants in this study is similar to the mean age of 68.3 years in the study by Sigdel et al. in their investigation of IPP among men with BPH in Nepal. It also conforms to a mean age of above 65 years demonstrated in other studies.,,, This is in support of the fact that BPH is a disease that comes with aging. The mean age of 67.09 years is above the mean age of less than 65 years by some other studies., Park et al., who found a mean age less than 65 years, excluded men with prostate volume greater than 40 mL and this may account for a lower mean age. The mean total IPSS of 17.05 in this study falls within the moderate IPSS range. Hou et al. also found a mean total IPSS of 17.05 among participants in their study. Most other studies reported mean IPSS within the moderate IPSS range.,,,, Puthenveetil et al., among Indian men with BPH, found a mean IPSS of 20, which is in severe IPSS range. This may be due to the fact that they excluded men with prostate volume of less than 40 mL. Excluding men with prostate volumes <40 mL will likely exclude mostly those men with grade I IPP.IPP is positively related to prostate volume and IPSS (as demonstrated in this study), hence the finding of mean IPSS in the severe IPSS range by Puthenveetil et al. The percentage of participants with mild, moderate, and severe grade total IPSS scores was 7.9%, 60.4%, and 31.7% respectively. This is similar to 9.8% (for mild), 56.6% (for moderate), and 33.6% (for severe) obtained by Lu et al. among a subset of men with BPH from a population of 122 elderly men with overactive bladder (AOB). AOB symptoms of urinary frequency, urgency, and urgency incontinence may mimic storage symptoms of BPH. Gyawali et al., in investigating IPP and TPV in predicting symptom severity in BPH, found more men (45%) in severe IPSS category. This may be due to a smaller sample size of 60 participants. The mean IPSS-V of 9.24 is more than the mean IPSS-S of 7.81. These are similar to the mean IPSS-V of 9.25 and mean IPSS-S of 7.78 obtained by Hou et al. Some other studies have shown mean IPSS-v greater than IPSS-S., Lu et al. found mean IPSS-V (7.2) less than mean IPSS-S (9.7). This reverse finding is not surprising as their study population was a group of men with AOB (although 51.6% of them had BPH in addition), and the hallmark of AOB is storage LUTS. The majority (59.4%) of the participants had grade III IPP. This is similar to the work done (using transabdominal ultrasound probe and similar bladder volume) by Aganovic et al. in which they found 57.7% of participants with grade III intravesical prostatic protrusion. Other studies have found preponderance of IPP grade I (Kuei et al. and Lee et al.) and grade II (Lu et al.). This may be due to smaller average TPV in those studies with conflicting findings of IPP grades that constitute majority of measured IPP. The significant positive correlation between IPP and IPSS (P = 0.000) is in agreement with other studies.,,, This suggests that IPP can help predict the severity of LUTS due to BPH. The difference in IPSS between various grades of IPP is mostly in IPP grade III showing that patients with IPP 10.0m m or more have more severe symptoms. Although other studies,,,,, have shown no significant correlation between IPP and IPSS, some of those studies used different bladder volumes for measurement of IPP, or did not state the bladder volume at which IPP was measured., Yuen et al. have shown that too little urine in bladder (volume <100 mL) overestimates IPP, whereas a bladder volume >400 mL underestimates IPP. This work found a significant positive correlation between IPP and IPSS-V. Thus, IPP significantly increases voiding symptoms in patients with BPH. This is in agreement with the studies by Tjahjodjati et al. in Indonesia and Park et al. in Korea. Furthermore, this study demonstrated a significant positive correlation between IPP and IPSS-S. This suggests that the effect of IPP on total IPSS arises from effect on both storage and voiding symptoms subscores. This may have implications in treatment of patients with BPH with significant IPP, as alleviation of obstruction with α-blockers may not improve total IPSS significantly because of little or no effect on storage symptoms. Several studies have made a similar observation of positive correlation between IPP and IPSS-S.,,,, Kuei et al. using a transrectal probe of 6.5 MHz (at an unspecified bladder volume for measurement of IPP) in a sample of 112 men in Taiwan found no significant correlation between IPP and IPSS-S. This contrary finding may be due to differences in route of ultrasound assessment and bladder volumes at which IPP was assessed. A significant positive correlation was found between IPP and IPSS QoL index in this study. Gyawali et al. found a similar significant positive correlation, while Lee et al. found an insignificant (though positive) correlation between IPP and IPSS QoL index. This positive correlation between IPP and IPSS QoL implies that patients with BPH with significant IPP may require a more aggressive approach to their treatment (not just watchful waiting!). Finally, the positive correlation between IPP and IPSS and between IPP and IPSS QoL index in this and other previous studies may make IPP an important noninvasive tool in the assessment of men with symptomatic BPH. Moreover, a significantly higher IPSS, IPSS-S, IPSS-V, and IPSS QoL index in patients with BPH with IPP of 10.0 mm or more were found. Therefore, patients with IPP of 10.0 mm or more are more likely to fail medical treatment and require surgical treatment. Practising urologists should routinely include abdominal ultrasound measurement of IPP in their initial assessment of patients with BPH. The authors wish to acknowledge the efforts of Dr. C CNduka of the Department of Radiology for the ultrasound assessment of patients used in this study. Ezeanyika LU, EjikeCE, Obidoa O, Elom SO. Prostate disorders in an apparently normal Nigerian population: Prevalence. Biokemistri 2006;18:127-32. Zhang SJ, Qian HN, Zhao Y, Sun K, Wang HQ, Liang GQ, et al. Relationship between age and prostate size. Asian J Androl 2013;15:116-20. Grossfeld GD, Coakley FV. Benign prostatic hyperplasia: Clinical overview and value of diagnostic imaging. Radiol Clin North Am 2000;38:31-47. Wei JT, Calhoun E, Jacobsen SJ. Urologic diseases in America project: Benign prostatic hyperplasia. J Urol 2005;173:1256-61. Tokgӧz Ö, Tokgӧz H, [INSIDE:2]nal Ȋ, Delibas U, Xildiz S, Voyvoda N, et al. Diagnostic value of detrusor wall thickness, postvoid residual urine and prostate volume to evaluate lower urinary tract symptoms in men. Diagn Interv Radiol 2012;18:277-81. Yang S, Hong WS, Lee JM, Kim T, Chung H, Kim HS, et al. Is intravesical prostatic protrusion associated with predominant and intractable storage symptoms in BPH patients with over 30 g of prostate volume? Neurourol Urodyn 2008;27:580-1. Roehrborn CG, McConnell JD. Benign prostatic hyperplasia: Etiology, pathophysiology, epidemiology and natural history. In: Wein AJ, editor. Campbell-Walsh Urology. 9th ed. Philadelphia, USA: Saunder Elsevier; 2007.p. 2727-65. Lepor H. Evaluating men with benign prostatic hyperplasia. Rev Urol 2004;6(Suppl 1):S8-15. Chia SJ, Heng CT, Chan SP, Foo KT. 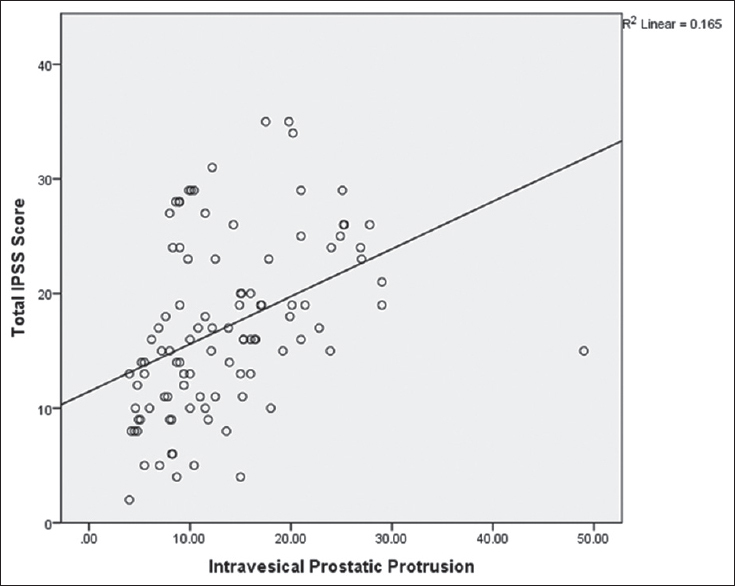 Correlation of intravesical prostatic protrusion with bladder outlet obstruction. BJU Int 2003;91:371-4. Hossain AK, Alam AK, Habib AK, Rashad MM, Rahman H, Islam AK, et al. Comparison between prostate volume and intravesical prostatic protrusion in detecting bladder outlet obstruction due to benign prostatic hyperplasia. Bangladesh Med Res Counc Bull 2012;38:14-7. Ziada A, Rosenblum M, Crawford ED. Benign prostatic hyperplasia: An overview. Urology 1999;53:1-6. Jacobsen SJ, Girman CJ, Guess HA, Oesterling JE, Lieber MM. New diagnostic and treatment guidelines for benign prostatic hyperplasia. Potential impact in the United States. Arch Intern Med 1995;155:477-81. Barry MJ. Evaluation of symptoms and quality of life in men with benign prostatic hyperplasia. Urology 2001;58(Suppl 6):25-32. Barry MJ, Fowler FJ Jr, O'Leary MP, Bruskewitz RC, Hottgrewe HL, Mebust WK, et al. The American Urological Association symptom index for benign prostatic hyperplasia. The measurement committee of the American Urological Association. Urology 1992;148:1549-64. Lee JW, Ryu JH, Yoo TK, Byun SS, Jeong YJ, Jung TY. The relationship between intravesical prostatic protrusion and postoperative outcomes in patients with benign prostatic hyperplasia. Korean J Urol 2012;53:478-82. Scarpa RM. Lower urinary tract symptoms (LUTS): What are the implications for the patients? Eur Urol 2001;40:12-20. Welch G, Kawachi I, Barry MJ. Distinction between symptoms of voiding and filling in benign prostatic hyperplasia: Findings from health professionals follow-up study. Urology 1998;113:161-3. Doo CK, Uh HS. Anatomic configuration of prostate obtained by noninvasive ultrasonography can predict clinical voiding parameters for determining BOO in men with LUTS. Urology 2009;73:232-6. Fitzpatrick JM. The natural history of benign prostatic hyperplasia. BJU Int 2006;97(Suppl 2):3-6. Dicuio M, Pomara G, Vesely S, Morelli G, Fabris FM, Alies V, et al. The use of prostatic intravesical protrusion correlated with uroflowmetry: A new method to measure obstruction in patients with LUTS due to BOO without using P/F studies. Arch Ital Urol Androl 2005;77:50-3. McVary KT. BPH: Epidemiology and comorbidities. Am J Manag Care 2006;12:S122-8. Franciosi M, Koff WJ, Rhoden EL. Correlation between the total volume, transitional zone volume of the prostate, transitional prostate zone index and lower urinary tract symptoms (LUTS). Int Urol Nephrol 2007;39:871-7. Nose H, Foo KT, Lim KB, Yokoyama T, Ozawa H, Kumon H. Accuracy of two noninvasive methods of diagnosing bladder outlet obstruction using ultrasonography: Intravesical prostatic protrusion and velocity-flow video urodynamics. Urology 2005;65:493-7. Zorba OU, Ṣanli MO, Akbulut MF, Akyol Y, Çekrezi B, Ozcan F. Relation between intravesical protrusion and prostate volume and their clinical effects in patients with benign prostate hyperplasia. T[INSIDE:1]rk [INSIDE:2]roloji Dergisi 2008;34:224-30. Lee A, Lee HJ, Lim KB, Huang HH, Ho H, Foo KT. Can intravesical prostatic protrusion predict bladder outlet obstruction even in men with good flow? Asian J Urol 2016;3:39-43. Lebdai S, Ammi M, Bigot P, Cornu JN, Mathieu R, Descazeaud A, Azzouzi AR. Clinical impact of the intravesical prostatic protrusion: A review by the LUTS committee of the French Urological Association. Prog Urol 2014;24:313-8. Lu SY, Yang CM, Fan YH, Lin AT, Chen KK. Intravesical prostatic protrusion correlates well with storage symptoms in elderly male patients with non-neurogenic overactive bladder. Urol Sci 2016;27:17-20. Tjahjodjati T, Santoso J. Relationship of prostate-urethral angle and intravesical prostatic protrusion with international prostatic symptoms score and uroflowmetry in benign prostatic hyperplasia patients. Int J Integr Health Sci 2015;3:50-4. Sigdel G, Belokar WK. Clinical significance of intravesical prostatic protrusion in patients with benign prostatic hyperplasia. J Univ Coll Med Sci 2015;3:6-10. Lee LS, Sim HG, Lim KB, Wang D, Foo KT. Intravesical prostatic protrusion predicts clinical progression of benign prostatic enlargement in patients receiving medical treatment. IntJUrol 2010;17:69-74. Hou CP, Lin YH, Chen CL, Tsai YL, Chang PL, Tsui KH. Impact of the static prostatic urethral angle on men with lower urinary tract symptoms. Urol Sci 2016;27:47-50. Lee JM, Chung H, Kim TW, Kim HS, Wang JH, Yang SK. 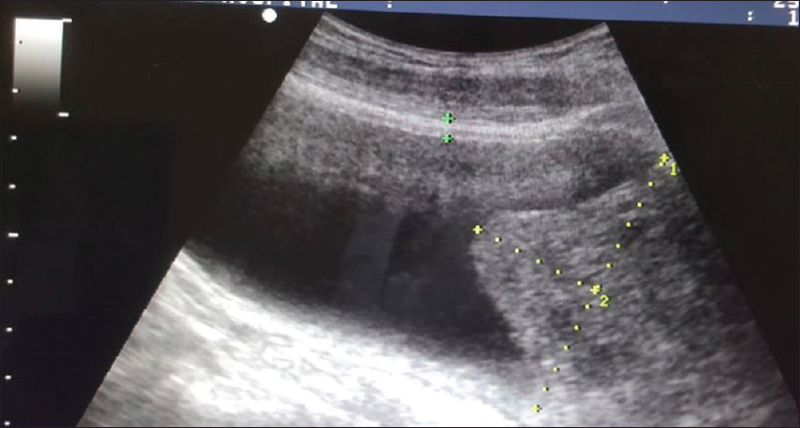 The correlation of intravesical prostatic protrusion with storage symptoms, as measured by transrectal ultrasound. Korean J Urol 2008;49:145-9. Kuei CH, Liao CH, Chiang BJ. Significant intravesical prostatic protrusion and prostatic calcification predict unfavorable outcomes of medical treatment for male lower urinary tract symptoms. Urol Sci 2016;27:13-6. Park YJ, Bae KH, Jin BS, Jung HJ, Park JS. Is increased prostatic urethral angle related to lower urinary tract symptoms in males with benign prostatic hyperplasia/lower urinary tract symptoms? Korean J Urol 2012;53:410-3. Gyawali PR, Shrestha GK, Joshi BR, Chalise PR, Sharma UK. Intravesical prostatic protrusion is better than prostate volume in predicting symptom severity in benign prostatic hyperplasia: A prospective clinical study. Post-Graduate Med J NAMS 2010;10:24-8. Puthenveetil RT, Baishya D, Barua S, Sarma D. Implication of ultrasound bladder parameters on treatment response in patients with benign prostatic hyperplasia under medical management. Asian J Urol 2015;2:233-7. Aganovic D, Hasanbegovic M, Prcic A, Kulovac B, Hadziosmanovic O. Which is a better indicator of bladder outlet obstruction in patients with benign prostatic enlargement-intravesical protrusion of prostate or bladder wall thickness. Med Arch 2012;66:324-8. Yuen SP, Ngiap JT, Cheng CW, Foo KT. Effects of bladder volume on transabdominal ultrasound measurement of intravesical prostatic volume. Int J Urol 2002;9:225-9.